People say that "science corrects itself". (But "science" is not an entity, so right away, they are guilty of the fallacy of reification.) This is not completely true. When it comes to evolutionism, proponents will resort to various tricks to keep their worldview going despite the evidence. There are anti-creationists who insist that creationists (especially biblical creationists) are "liars" and "fact deniers". Their basis for such accusations? It is primarily because we do not believe in the atheistic, old-earth, evolutionary interpretations of the evidence. Further, we promote evidence that refutes evolution and affirms a young earth. This is contrary to the spirit of scientific inquiry. Interestingly, those who call us "liars" are guilty of blatant hypocrisy, promoting not only bad science, carelessness (by people who should know better), deception and even outright fraud. Worse than this, shoddy research and dishonest pronouncements in attempts to rehabilitate dishonesty and bad research prove the accusers to be the liars, not us! In a previous post, we heckled Haeckle's blatant fraud in embryonic recapitulation. And it is still in textbooks today. While creationists make honest mistakes, they are not in the habit of defending untruths. Nor are we in the habit of trying to make up our own "facts" to promote a fundamentally flawed worldview. 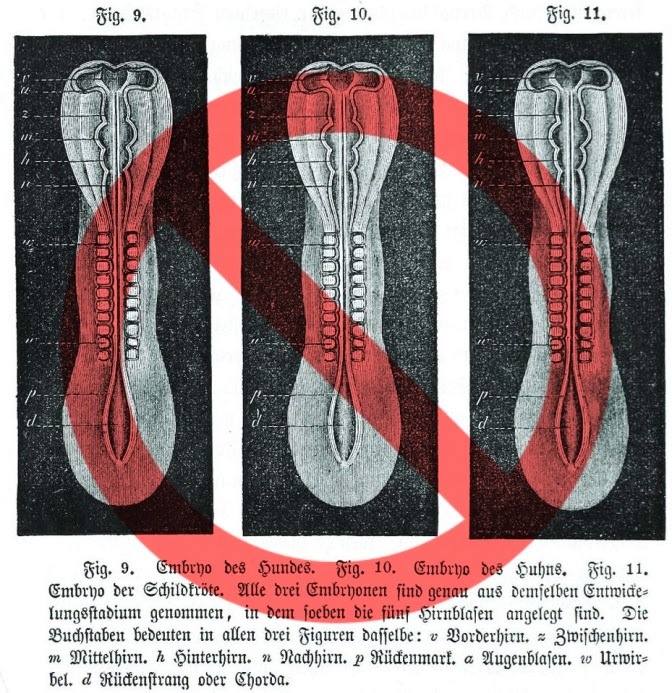 Perhaps one reason people keep Haeckel in the spotlight is because his pseudoscience has been used to justify abortion. After all, why worry when it's not human, but just a fish, right? E. van Niekerk continues the exceptional analysis of Haeckel's material, and demonstrates that not only was there more problems with his stuff than we knew, the attempts to rehabilitate, excuse and even reinstate him (by people who know the facts) are misleading at best. For example, the blatant proven fraud is brushed aside in this Wikipedia article. Ernst Haeckel is well known for his fakery of embryos in the tailbud stage of development. There is also the earlier issue of where Haeckel illegitimately reprinted the same woodcut three times, alleging these three illustrations represent different animals, while drawing conclusions from the (artificially created) similarities. 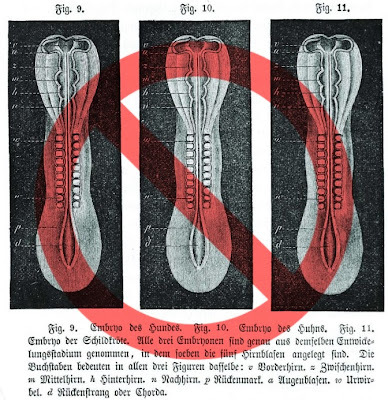 One historian makes a serious attempt to excuse Haeckel, yet further analysis shows Haeckel’s deception is even worse than was previously thought. You should delve into "Countering revisionism—part 2: Ernst Haeckel and his triple-woodcut print".